Chunnel is Target of Christmas Terror Plot! The terror threat level is Sky High! The amount of “chatter” has not been this high since 2001! 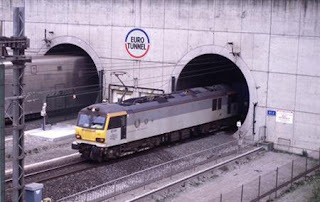 The CIA passed this information to French Intelligence services on December 19, 2006, warning that the English to France tunnel is the target of a Christmas terror attack. The tunnel beneath the English Channel that connects Britain to France is a Christmas terror target of Islamic terrorists, according to a report published Sunday. The plot, which was first uncovered by the United States CIA and passed along to the French intelligence service on Dec. 19, is aimed at the heavy rush of holiday travel, according to the report in the Sunday Observer. While there are currently no specific details, what is known comes from a secret report to the French government on terror threat levels. In reaction, British and French officials have continually checked the security system protecting the 31-mile tunnel. The French warn the threat level remains high. British security forces will remain on high alert throughout the holiday season. French sources said the plan was formulated in Pakistan and is being directed from there. The terror plotters are believed to possibly be Britons of Pakistani descent, said the sources. The report also mentions a possible Al Qaeda plan to attack an unidentified European country between September 2006 and April 2007, a plan orchestrated from Syria and Iran. According to the French sources, the plan was put together in Pakistan and is being directed from there. The plotters are believed to be Western Europeans, possibly Britons of Pakistani descent. The DGSE say that levels of ‘chatter’, the constant communication that takes place between militants, has not been so high since 2001. Last week Sir Ian Blair, the head of the Metropolitan Police, described “the threat of another terrorist attempt” as “ever present” adding that “Christmas is a period when that might happen”. More than 400,000 British citizens travel to Pakistan every year. Though the vast majority are visiting family or friends, some have exploited the ease of travel for darker reasons: at least two of the 7/7 bombers spent time in the south-west Asian state. Last week news reports in America detailed a squad of a dozen English-speaking militants, nine of whom are said to be British who, having sought out the al-Qaeda bases, have now been trained to a high level in terrorist tactics. The group is known as the English Brothers because of their shared language. Apart from the nine Britons, the squad is made up of an Australian and two Norwegians. Gates of Vienna says the Chunnel must be a tempting trophy “since the advent of the EU there have been no customs or immigration checks at either end.” Great! Reliapundit has more on the threat.